Five men illegally working on the regeneration of Queens Square were ‘not direct employees’ of the construction company, it has said. 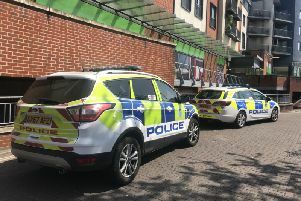 Immigration Enforcement officers were called to Crawley town centre at 11am yesterday (April 25). A spokesman for the Home Office said immigration checks revealed five Albanian men, aged between 25 and 33, working on a construction site in Queens Square were in the UK illegally. They were arrested and detained pending their removal from the UK. The Home Office added the men were employed by Blakedown Landscapes Ltd. and the company was facing an £100,000 fine unless evidence was provided that pre-employment checks were carried out. Steve Buckingham, managing director at Blakedown Landscapes, said: “We are the contractors working for Crawley Borough Council, enhancing the paved areas at Queens Square. “The men were working on our site, but they are not direct employees of Blakedown Landscapes.